N.B. Walkers route goes clockwise. Runners route goes anti-clockwise. ∆ Start – 958211 - Event Centre. Proceeds up minor road to Innis a’Chrotha, crosses wooden bridge over the River Croe, then continues on good footpath beside the Abhainn Chonaig. After 1 mile ignore path branch to left and continue on main path to enter Gleann Choinneachain (photo left) as it gradually rises up towards Bealach an Sgairne, the highest point on the route. Please take care on this section as the narrow path contours the northern slopes of Bheinn Fhada. Next cross the river Allt a Choire Chaoil emerging from Coire an Sgairne (support will be available if river is in spate). From there the path zig-zags steeply upwards (ignore path branch to right) towards Bealach an Sgairne through the narrowing defile between a’Ghlas-bheinn and Bheinn Fhada. 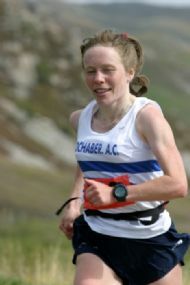 ∆ Checkpoint - 013215 - Summit of Bealach an Sgairne. Route now continues down to the south end of Loch a’Bhealaich. 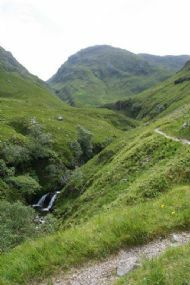 From here the path becomes boggy in places, as the route crosses the Scottish watershed and continues down Gleann Gniomhaidh, but improves as it approaches the Allt Bheithe Garbh river. ∆ Checkpoint - 073198 - Confluence of Allt Bheithe Garbh and River Affric. Route now turns right into Fionngleann, heading south-west.The next river – Allt Gleann Gniomhaidh – can usually be forded easily, but note there is a bridge a short distance upstream. The way proceeds past Camban Bothy and soon crosses the Scottish watershed again before starting the rocky descent towards the spectacular Allt Grannda gorge. Great care required on this next section – single file please. ∆ Checkpoint – 024174 - Allt Grannda Waterfalls. A highly scenic spot but requiring utmost care with footing. From here the route curves round the Grannda basin and descends the southern slopes of Beinn Fhada into Gleann Lichd, crossing the Allt Grannda and Allt an Lapain rivers by footbridges, and then on to Glenlicht House. ∆ Checkpoint – 005173 - Glenlicht House. “Kenny's Cafe" - abundant food and fluids. This is also the turning point of the Gleann Lichd 8 miler. The route follows the winding land-rover track beside the clear waters of the fabulous River Croe back to Morvich and the Event Centre. ∆ Start – 958211 - Event Centre. Goes west on old loop road for 400 yards, then turns sharp right on minor road through the settlements of Ruarach and Lienassie and on to Dorusduain Wood. Enter forest at car park and follow signs to Glomach Falls for 1 mile. ∆ Checkpoint - 985238 - Top of Dorusduain Wood. Exits wood at bridge and follows excellent stalkers path rising steeply on north side of Allt an Leoid Ghaineamhaich. After 1.8 miles the top of the climb is reached at Bealach na Sroine, with fantastic views in all directions. ∆ Checkpoint - 007247 - Bealach na Sroine. From here route turns off left and follows open ground (flagged) west for 1.3 miles, contouring the southern slopes of Carnan Cruithneachd, to reach the next checkpoint at Bealach Con. ∆ Checkpoint – 986252 - Bealach Con. Turn left and follow old track back down to Dorusduain Wood. Very steep descent on entering wood for 300 yards, until forest road is reached. Turn left here and follow this road as it zig-zags down towards the river, then gradually descends the west bank to next checkpoint. ∆ Checkpoint – 983228 - Intersection point with outward route. Turn left here and follow arrows to arrive at Gob na Roinne Bridge over the Abhainn Chonaig. Once over the bridge turn right and follow footpath beside the river to reach Innis a’Chrotha, where road is joined for the last half mile back to Event Centre. ∆ Start – 958211 – Event Centre. 4 miles out and back to Glenlicht House, with walking or running options. An inspiring low-level route winding through spectacular Gleann Lichd beside the tumbling waters of the River Croe, with The Five Sisters of Kintail mountain range on one side and the huge bulk of Beinn Fhada dominating the other. 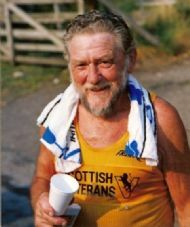 Checkpoint and refreshments at Glenlicht House. Wonderful views in both directions to give probably the best out and back trip in these quarters. Suitable for all ages and fitness levels.